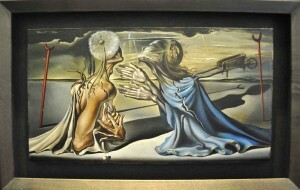 Last, but certainly not least in my profile of Spanish artists is the infamous artistic innovator Salvador Dalí. He is best know for the outlandish yet technical excellence of his paintings, and landing surrealism on the artistic world map. Although his work is highly varied, he was often criticized for violent, disturbing, and sexual images. Dalí explored aspects of the human psyche and dream state that darned not be looked at, along with Freud’s emerging psychiatric concepts of the id. Can you see the face of Mae West? 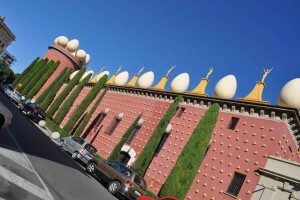 An easy day trip by train from Barcelona, the Dalí Theater-Museum in Figueres is the quintessential site for all that is Dalí. He had a deep connection to this place as he was a native of Figueres, and his first art show as a teenager was in this theater building. After destruction in the Spanish Civil War, Dalí personally collaborated on the design, rebuild and additions to the structure and all that’s in it. He even included a crypt for himself. After all, he was baptized in the church just across the street. The building itself is considered the world’s largest surrealist objet d’art. It’s outlandish exterior sports pink walls symmetrically adorned w/ golden studs, massive “eggs” randomly teetering along the parapet edge, and a geodesic dome over a portion of the roof. The landscaping is unusually conservative, with evergreen spires rhythmically punctuating the facade. The museum interior is also an integrated and cohesive work of art with every detail designed to contribute, maximize, and support the experience of the viewer. 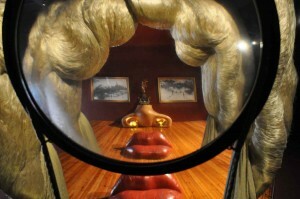 The comprehensive museum displays Dalí’s paintings, animated art, prints and line art, along with furniture, and sculpture. His 3D compositions, several designed specifically for this building, produce hard to describe visual effects of artistic juxtaposition. Seen in total, the collages create figurative imagery from cleverly arranged ordinary objects. 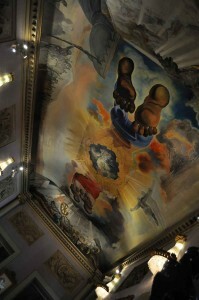 A fascinating and symbolic ceiling painting in the former smoking lounge possibly mocks at historical images such as the Sistine Chapel, and depicts Dalí and his wife Gala ascending to heaven in the afterlife. Throughout his life, Gala was his rock and compass and kept him from slipping too far into the dark side. Her image appears in his work frequently. A separate exhibit, Dalí’s Jewels, is entered through a startling black hole exterior access. Displays include his unbelievable jewelry designs and the beautiful sketches documenting their ingenious creation. 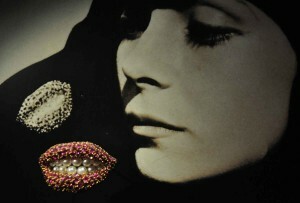 Some pieces capture surrealistic imagery in glittering jewels and gold, along with a few “see to believe” animated objects such as the “breathing heart”. 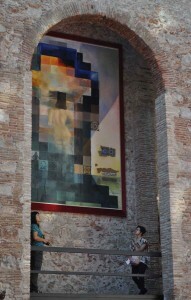 The town of Figueres is a quiet place, perhaps with the exception of being bombarded by tourists visiting the museum. We got the feeling the residents like to tourists to “get lost” and spend some Euro, as the museum is a 15 minute walk from the train station and we didn’t notice much help in the way of signage. It seemed like a friendly, pleasant town so if you go, do get lost, and enjoy all that Figueres has to offer. Asked if he was on drugs, Dalí responded, “I am the drug, take me.” He also said “there are two kinds of visitors (to the museum)- those that don’t need a description, and those that aren’t worth one.” Could be insulting, but I suspect Dalí never worried about such things. His imaginative works are provocative to this day. 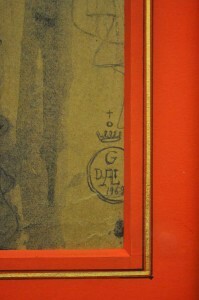 Interestingly, throughout the museum we noticed Dali changed the style of his signature many times!